This is an important weekend. It’s Mother’s Day weekend, yes. 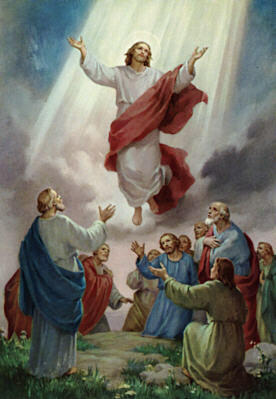 But it’s also the weekend the church celebrates one of the most important, yet under-the-radar, events of the Christian year: yesterday having been Ascension Day, this Sunday is the day when the church marks the ascension of our Lord Jesus Christ. In many churches – including my own – it will get but a passing nod. In many more churches it gets less than that. But the celebration of the ascension of Jesus deserves our attention. After all, as Tim Perry and Aaron Perry say in He Ascended Into Heaven (Paraclete, 2010), “Resurrection is the beginning of ascension; ascension is resurrection completed” (6), and, “The Ascension marks both the completion of the Son’s mission and the beginning of the mission of his followers – to bear witness to his triumph” (49). Any doubt as to the veracity of the resurrection of Jesus was settled when he ascended into heaven. And this, with the great commission, began the work of making disciples, baptizing and teaching. So Ascension Sunday is a bit like Launch Day: it signifies a new beginning for the church, a new opportunity to commit to the work of making disciples. If you haven’t been doing all you can to draw people to the Lord – thinking like a missionary, as I said last Sunday in my message – then consider this Sunday, Ascension Sunday, a chance for a fresh start. And as Luke’s telling of the ascension hints, we don’t have to undertake that fresh start alone! “But you will receive power when the Holy Spirit comes upon you. And you will be my witnesses, telling people about me everywhere – in Jerusalem, throughout Judea, in Samaria, and to the ends of the earth” (Acts 1.8, NLT).